The Bachelor of Engineering with Honours in Electronic and Computer Engineering is a four-year programme. This programme aims to equip students with the academic knowledge necessary for a professional engineer in the fields of electronic engineering and computer engineering. It provides a challenging programme for students who aspire to become leaders in the technological world, and who wish to contribute to the development of electronic, computer and communication systems in the ever-changing knowledge-based economy. The core courses in the first two years cover a wide variety of subjects in electronic engineering and computer engineering. In Years 3 and 4, students select areas of specialization based on their own personal and career interests. The specialization courses cover a wide range of subjects, including mobile and wireless networks, digital signal processing, biomedical engineering technologies, digital multimedia, and software engineering. Apart from these technical subjects, students also study several peripheral subjects essential for their future employment as professional engineers. While many of the major courses already include laboratory experiments and hands-on exercises, students will spend the second summer in a workshop in order to undergo industrial training. Industrial attachment, in which a student works as a trainee in a company, takes place in the third summer of the programme. This practicum exposes them to a real environment in the industry so that they can get a preview of an engineering career. For certain courses, students are required to study in the Summer Term. Please click here to view the programme structure. 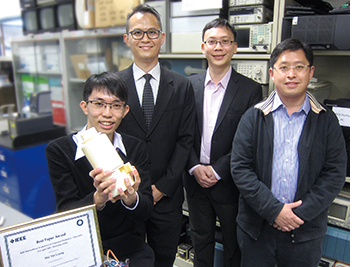 Full-time Electronic and Computer Engineering graduates, Lee Tsz Chung and Leung Ho Wai won the Best Paper Award for their paper entitled, “Investigation of sEMG patterns for Detection of Poor Trunk Posture,” at the IEEE International Conference on Consumer Electronics – China 2016. Collaborating with a medical device company, they have found a new way to effectively monitor a person’s body posture based on measuring electrical signals from the back muscles. Upon detection of poor posture, the device would alert the user for immediate corrective actions.